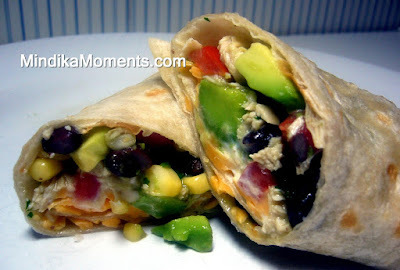 Ok Mom's (or anyone for that matter) here's another lunch idea. This one's going to be a little more work, but the good news is...I think your kids will like it too. And I guarantee from start to finish they'll take just about as long as a box of mac & cheese. Also, feel free to leave out the chicken, if that's more work or if you simply don't eat meat. These are my husbands and little "r"'s favorite...meat or no meat. They are loaded with flavor and pretty healthy too. 1. In a mixing bowl, whisk together the cilantro, lime juice, red pepper flakes, and honey. 2. Add the shredded chicken and toss gently to coat. 3. Add the corn, black beans, avocado and tomato. Season with salt. 4. Serve wrapped in tortillas with sour cream and cheddar cheese. Mmmmm wraps are one of my favorite things to eat, I could pretty much eat everything in a tortilla ;] I actually put peanut butter & sliced strawberrys in a wrap for breakfast. I LOVE your banner, it's clean, whimsical and beautiful! Thanks bcgw! And I'm totally with you on the wraps. Everything taste good wrapped in a tortilla. We must think alike because I eat peanut butter and strawberries in tortilla's for breakfast all the time. My husband thinks I'm crazy, but I love peanut butter and strawberries. It's nice to know there's someone else out there who like it too.